For at least consecutive 90 days of service with the Multinational Force and Observers Organization. The Multinational Force and Observers (MFO) was created to operate as a buffer between Egypt and Israel in the Sinai Peninsula. 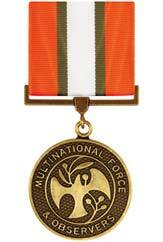 In 1984 the US Department of Defense approved issuance of the MFO Medal to US Armed Forces personnel for service with the MFO after 3 August 1981.